All whole-class reading and writing skills should be executed in mini-lessons. Identify a single, small skill to teach within each short, 10 to 15-minute lesson. Lessons should be short or "mini" because students don't get better listening to the lesson. They don't become better writers or stronger readers in the lesson. They get better after the lesson when they're attempting the skill and working to incorporate it into their own reading and writing. Within a 10-15 minute lesson, the teacher should execute 4 steps. Announce the day's mini-lesson skill. CAUTION! Remember to keep the focus small. For example, don't teach grammar in a mini-lesson, but rather how to incorporate a prepositional phrase into a sentence. Don't teach report writing in a mini-lesson, but rather how to reference a source within a paragraph. In reading, don't teach visualization in a mini-lesson, but rather how to visualize character feelings. If Step 2 is the "I do," then Step 3 is the "We do." During this part of the lesson, the whole class works together to apply the skill with the teacher close by to provide support. After demonstrating the skill back in Step 2, utilize different examples here in Step 3. For example, reveal different sentences for students to include prepositional phrases. Show additional paragraphs for the class to incorporate cited sources into. Or, read new excerpts and ask students to visualize how characters are feeling. Step 4 closes the mini-lesson and sets students up for a response activity. After the "I do" (Step 2) and the "We do" (Step 3), it's time for the "You do" (Step 4). Identify what you want students to do with the skill on their own. While reading/writing today, I'd like you to. . . Remember, the students don't get better during the lesson--It's after the lesson when they practice the skill that they improve their abilities. Consequently, keep the lesson short. The four steps of an effective mini-lesson are married to the gradual release of responsibility. However, do not expect students to master a literacy skill in one 15-minute lesson. Plan a multi-day series where you execute the 4 steps each day, shifting the responsibility as the students get better and better. The "I do" portion (Step 2) will get shorter and shorter. The "We do" component (Step 3) will get harder and more sophisticated. And the "You do" tasks (Step 4) become even more independent. If you want to begin planning your mini-lessons utilizing these four steps, access this Word document and type directly into it. 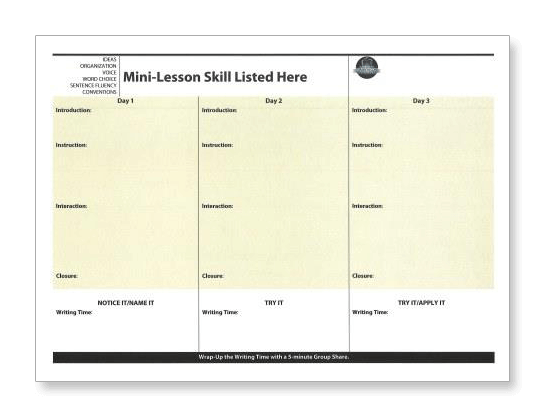 NOTE: This template includes three days/three mini-lessons focused on one skill. This allows you to plan a multi-day series.